In Minnesota's leading newspaper, The Star Tribune, the coverage granted to the recently proposed merger of twenty-one of our Catholic parishes with neighboring parishes has been sympathetic, both to the archdiocesan authorities seeking resolution to problems that are serious and to the parishes concerned. Two weeks ago this past Friday, in a major article introduced on the paper's front page and continued at length on page six, the Star Tribune's religion reporter, Rose French, gave considerable prominence to OUR parish, with an accompanying photograph in full color. For those of you who do not subscribe to the Star Tribune, I am reprinting Ms. French's article here. Eighteen of 21 parishes facing reorganization ask archdiocese to reconsider. The Rev. George Welzbacher, the pastor at St. John in St. Paul, said more than 100 parishioners signed a petition against the archdiocese’s plan to merge the church with nearby St. Pascal Baylon. All but three of the 21 Roman Catholic parishes facing mergers with other parishes and the prospect of the closing of churches that have served generations of Twin Cities families are appealing their fate, Archdiocese of St. Paul and Minneapolis officials said Thursday. More than 100 written petitions have poured in from parishioners and church leaders asking Archbishop Nienstedt to reconsider the Archdiocese's sweeping reorganization plan, which calls for 21 parishes to merge with 14 receiving parishes. In addition, 33 parishes will join in new "clusters" in which one pastor will lead two or more parishes. The reorganization will cut the number of parishes from 213 to 192 and is a response to tighter budgets, shifting demographics and a projected shortage of priests. It is part of the biggest reorganization in the history of the archdiocese, which now has 800,000 Catholics. The plan, announced last month, will begin in January and take several years to be implemented. Archdiocese spokesman Dennis McGrath said the archdiocese is not surprised or discouraged by the high number of appeals. "I think you have to expect this," McGrath said. "People's churches are pretty important to them. If they feel they have a valid reason for challenging this, they're going to do it." The only three of the 21 parishes that did not appeal were St. Augustine in South St. Paul, which is merging with Holy Trinity; St. Joseph in Lexington, which is merging with St. Wenceslaus, and St. Vincent de Paul in St. Paul, which will merge with the Cathedral of St. Paul. One church appealing is St. John's in St. Paul, set to merge with nearby St. Pascal Baylon. St. John's pastor, the Rev. George Welzbacher, said more than 100 parishioners signed a petition, and he also wrote a letter to the archbishop suggesting an "alternative plan" that he declined to elaborate on. "There was no tone of anger in the petition," Welzbacher said. "Sadness, yes, but people do recognize facts are facts. Sometimes there is no alternative." Founded in 1886, St. John's parish has nearly 400 members and hopes to find a major tenant to lease space in the building that once housed the parish school, Welzbacher said. That building has been home to a number of nonprofit agencies and schools since it closed in the 1970s. "Our people are very generous ... but the numbers simply aren't there for the maintenance of our campus," he said. "With our present income we will reach a point where we would have to have additional funds." The reorganization plan is the result of 20 months of study and consultation with thousands of people -- clergy, parish and Catholic school leaders and staff, parishioners and Catholic school families, archdiocese officials say. The plan also looked at the viability of the archdiocese's schools, and an announcement about them is expected in the coming months. Though some schools might be closed eventually, all will continue to operate at least through the current school year. Of the 21 churches slated to merge, six are in St. Paul and five in Minneapolis. The rest are in suburbs, exurbs or small towns. Diocesan officials say a number of parishes and school buildings are grouped in areas where the population can no longer sustain more than one parish or school. The archdiocese has grown to nearly 800,000 members in the past decade, an increase fueled by immigration as well as growth in some suburban areas. The archdiocese also expects to have 19 fewer priests eligible to serve as pastors by 2020. [Given the recent growth in the number of seminarians, this may change for the better]. Of the 302 priests in the archdiocese, 182 are eligible to be pastors. Nienstedt has acknowledged the difficulty of the changes. "Please know of my personal concern and prayers for members of this local church who will eventually suffer the loss of a beloved parish home or parish, and for Catholic school employees who are worried about losing their jobs," he said in a recent statement. "I am hopeful that upon reflection everyone in the archdiocese will see the long-range benefits that these changes will bring and I respectfully ask for your acceptance and understanding." The Rev. Tom Reese, a senior fellow at the Woodstock Theological Center at Georgetown University in Washington, D.C., who has studied other diocesan reorganizations, said parishioners become very attached to their churches and do anything they can to preserve them. When the Boston archdiocese reorganized several years ago, some parishioners held 24-hour sit-ins in churches, Reese noted. "These are holy places for them, where they've had important spiritual experiences in their lives," Reese said. "That makes it very difficult for a bishop to pull off this kind of reorganization ... in any way that keeps everybody happy. It's impossible." Catholic canon law provides a means to appeal the reorganization plan. An appeal must include a petition to the archbishop outlining why the decision should be changed. It can take months to get an answer. McGrath said the archbishop expanded the appeal process to ensure that people have a forum for their concerns. He stressed it's not known yet just how many church buildings may be closing. Decisions regarding property of the merging parishes will be made by local leaders in consultation with the archbishop and a representative body of priests. The Rev. 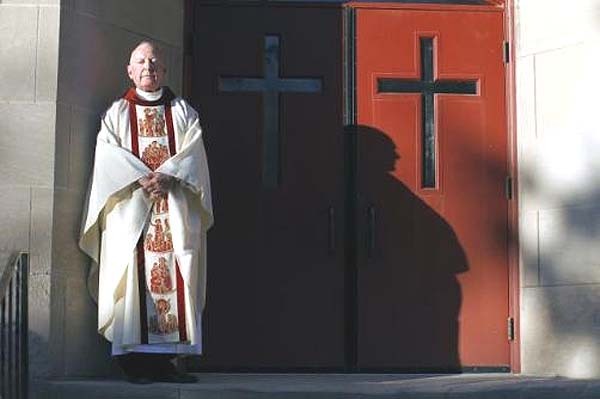 Thomas O'Brien said parishioners at Visitation Church in south Minneapolis have sent a letter asking the archbishop to reconsider its merger with nearby Annunciation. He noted the church can support itself financially and has recently negotiated a lease agreement with T-Mobile for the company to use the chimney on its grounds to support phone service in the area. The former parish school building also has a charter school as a tenant he said. "We have assured the archbishop we're making the appeal in prayerful respect for his ultimate decision, whatever he decides we will abide by," O'Brien said. "The many advances we have made in the past two to three years speak not only to long-term viability, but also, and most importantly, to the resources we have to reach beyond our own walls and to ... serve the needs of the poor, the rnarginalized and the immigrant."